I just had to say something about this new lipstick that I got from my mom. It really is just a gorgeous color and what's more is that I got it for free! This is the first Mary Kay product I've ever tried and I'm really happy with it. The hues of ripe berries and juicy apples were blended together in this fresh shade – just one of the many glamorous shades from the Mary Kay® Creme Lipstick collection. The long-wearing, stay-true color glides on with a lightweight, creamy texture for maximum color impact that lasts. Plus, it won’t feather or bleed. It’s even enhanced with vitamin E and a vitamin C derivative to help defend against wrinkle-causing free radicals. And it’s enriched with emollients and moisturizers, providing a veil of protection against moisture loss. Fragrance-free with a hint of vanilla flavor, the lipstick is perfect for combining with Mary Kay® Lip Liner and NouriShine® Lip Gloss. * the price is too steep for a single tube of lipstick, but that's just me. 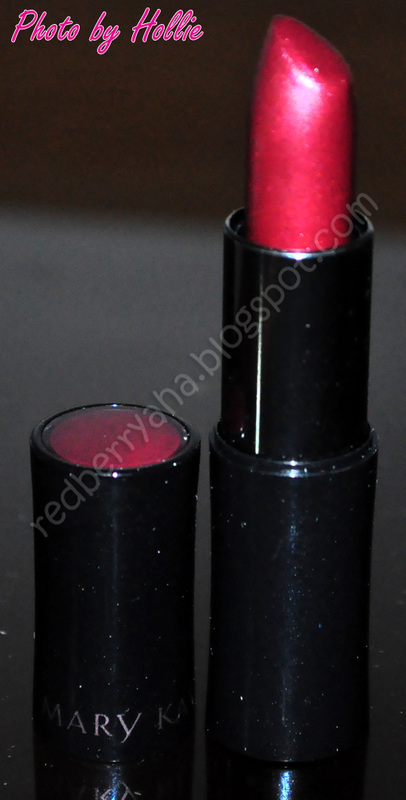 I would gladly recommend this lipstick to you ladies, it's definitely worth the try. Plus, the shades they offer are just so darn gorgeous (so tempting). Have you tried any products from Mary Kay? If so, tell me about it. By the way, don't forget to join my Local Giveaway HERE. My mom's a Mary Kay dealer too, but mostly we just buy products for our own use. Haha, love their skin care products! @DamnVixen, My mom uses their skin care line too! @Debi, I can't deny that it's a really good product. @Elaine, lol! my mom really loves their skin care line, I've only tried their facial wash though, it was okay. seriously, i love the color. i always love anything in berry color. i find its the safe shade for all skin type. though, i havent tried anything from mary kay. i dont know where to get it. it looks gorgeous on your lips dear! 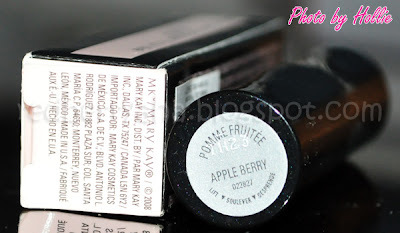 =) i tried mary kay lippies way back then but haven't bought anything from them in such a long time. lovely shade Hollie! Haven't tried any of MK's products but Im curious about their liquid foundation coz of the good reviews. natry mo na? @Hazel, yeps didn't dry out my lips, seriously. @Sugar sugar, Thank you. they have new products, you should check it out. @Shopcoholic, Yeps, I tried their foundation once, because my mom has one. It really has a nice feel to it. It feels very light, has good coverage, and it doesn't cake. My mom loves their foundie. @Reina, you can find it through Mary Kay direct sellers. I love Mary Kay products though a bit pricey but it's worth it. I've been using Mary Kay moisturizing cream for over a year now. I'm thinking of pairing it with Mary Kay 3 in 1 cleanser but I do not have the mobile number of the Mary Representative I talk to before. I love their creme lipsticks too! I'm using red salsa, and toffee..very nice shades. Since I'm a dealer, I get to use the products. The botanical moisturizers are perfect this summer! F u do bznes with mary kay u r not calld dealer but an INDEPENDENT BEAUTY CONSULTANT.We dont jz sel for the sake of earnings but we help or guide our customers find der neds wen it comes to beauty products.U shud try all d mary kay products not jz d cosmetics but the skin care products ul se an imed8 result after one application i asure u dat 100%.